If you suffer from arthritis, turmeric milk consumed twice before meals will help to eliminate the symptoms associated with this condition. Curcumin acts as an anti-inflammatory and helps to relieve arthritic patients of the swelling they incur and also allows the ligaments to become more flexible, which in turn decreases their pain level. An effective way to help to alleviate the symptoms of osteoporosis and to reduce bone loss associated with this condition is to add turmeric milk to the patient’s diet. The blood purifying agent in turmeric encourages liver function, which proves it to be an ideal herb for natural detoxification. The liver can be supported by the turmeric; all the while the turmeric can cleanse the lymphatic system. It also, for the most favorable liver function, stimulates the flow of bile and stimulates the liver as well, which assists in the prevention of gallstones. Watch the video for how to make turmeric golden milk for the above-mentioned conditions. An effective cure for respiratory illness is the turmeric milk ginger and black pepper combination. The anti-inflammatory properties in turmeric help to reduce inflammation in the respiratory passages. Lung congestion and sinus congestion can be alleviated through the consumption of this mixture. Turmeric milk also defends against any infections that try to invade the body, cures congestion in the nasal tract and helps to relieve the symptoms of asthma. The healing benefits of turmeric milk for irritated throats, coughs, bronchitis and the flu can be noticed in as soon as twenty-four hours. Sore throat is a common respiratory problem which can be effectively relived by turmeric milk. Turmeric has a high antioxidant level that can help aid patients who are fighting cancer as well as assisting to relieve them of the side effects from chemotherapy. Turmeric can also, when ½ a teaspoon is taken once a day, prevent the deoxyribonucleic acid (DNA) damage that is caused by cancerous cells in the body of a cancer patient. A helpful aid in treating redness or rashes on the skin, most commonly on the face, is using a turmeric milk mixture on the affected area(s). The mixture is comprised of milk with a pinch of turmeric in it. It can be applied by soaking a cotton ball in the mixture and then blotting the area where the redness or rash is present; this should be left on the skin for a period of ten minutes and then washed off. The final outcome is the skin appearing much less red as well as any rash decreasing. To help aid in the fight of free radicals, which are organic molecules that are responsible for ageing, tissue damage and possibly some disease, consuming turmeric milk is recommended, due to its rich antioxidant content. Turmeric brings a truly holistic approach to the digestive health of individuals. It is a potent antiseptic with anti-inflammatory properties that help to promote intestinal health. It also works to treat colitis and stomach ulcers. The digestive tract is guarded with the use of turmeric milk in order to prevent ulcers, diarrhea and indigestion, and this in conjunction with the enhanced blood flow provided, promotes one’s digestive health. It is important to note that low-fat milk is a better choice than whole milk, as whole milk may increase the risk of diarrhea. Reducing inflammation, pain or swelling and curing headaches can be achieved by consuming turmeric, this Avurvedic medicine, also referred to as natural aspirin. For a sure shot at a good night sleep, heat up a cup of milk and add a pinch of turmeric, the warm milk combined with turmeric has a warming effect that will help aid in sleeping. 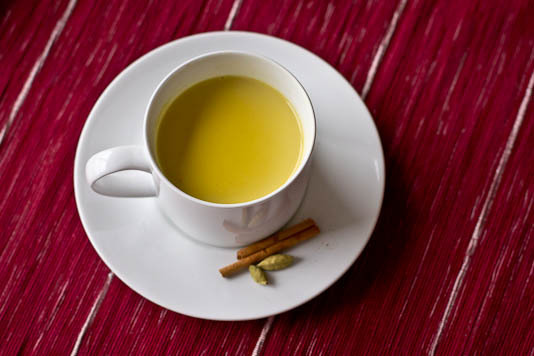 Flavoring the turmeric milk with vanilla extract, cinnamon or other spices of your choice can enrich the taste of the turmeric milk and help ease you into a peaceful night’s sleep. In Avurvedic tradition, turmeric milk is used as a effective blood cleanser. It not only boosts blood circulation in the body, but it also decreases blood thickness, which help cleanse the blood vessels, lymphatic system and tissues as well as other impurities. Adding turmeric to milk, which is well known to be an excellent content of calcium, provides additional benefits to the normal bone health that milk provides. Therefore, bones are kept strong and healthy by the milk and they get an extra boost through the use of turmeric. To help to ease menstrual cramps and pain associated with menstruation, turmeric milk can be helpful, due to the fact that it works as an potent antispasmodic, which is an herb that suppresses muscle spasms. A glass of turmeric milk a day can aid in the treatment of eczema. Opposed to drinking an unhealthy sugar filled soda or energy drink, drinking a glass of turmeric milk can aid in weight loss, because turmeric help break down the dietary fat. During the final trimester, consuming turmeric milk can help pregnant women to have an easy delivery. New mothers soon after giving birth can benefit from the use of turmeric milk, as it helps with the woman’s overall health, improving lactation and allowing for faster contractions of the ovaries. Pregnant women should consult their obstetrician before consuming turmeric with milk, as well as any herbal supplements, over the counter or prescription medications, as there is sometimes a risk associated with pregnancy. It is also important to be aware that consuming excessive amounts of turmeric milk can lead to an upset stomach, and any persons who have difficulties with or are allergic to dairy products should in no circumstances consume turmeric milk. The basic recipe for turmeric milk does tend to have a very bitter taste, as the turmeric powder is not cooked fully through, but when cooked through it tastes much better. This more exotic form of turmeric milk has a variety of forms of preparation and there are several spices that are blended in with it to help to promote the flavor as well as the health benefits it provides. Ingredients: A quarter cup of water, a half a teaspoon of fresh minced ginger, some whole peppercorns of crushed black pepper, a quarter of a teaspoon of whole or ground cardamom, a teaspoon of honey, a half of a teaspoon to a whole teaspoon of turmeric paste, three quarters of a cup of milk, a quarter of a teaspoon of almond oil (or sesame oil, coconut oil). And for a healthy garnish, add pistachios, almonds, dates, saffron strands and fig. Instructions: Begin by combining water, ginger, fresh pepper, cardamom, honey and turmeric paste in a saucepan. Stir the contents and put them into a boil and allow it to cook for several minutes. Add the milk and allow to heat up, but not to boil. And then add the oil, your choice of one of the healthy garnishes and sit back and enjoy.